The four-finger trigger action is suitable for those with a limited grip, while the 360° revolving head does away with the need to rotate the wrist, which may be painful for some users. Other features include an easy-grip shoehorn and rubber-lined jaws that provide extra grip when lifting and a useful magnet. Combi-Reacher’s tips are designed for easy pick-up and scooping of papers. Trigger contains minimal dirt traps, resulting in easier cleaning. 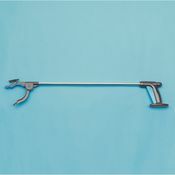 The clip is ideal for storing the reacher on a walking frame. Available in two lengths.